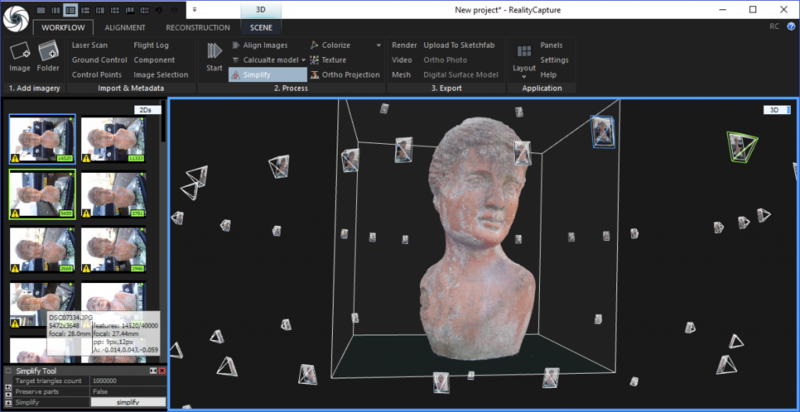 ReCap Photo is Autodesk’s latest product for 3D Reality Capture through Photogrammetry. But before I dive into reviewing it, let’s talk about the product’s interesting evolution. Unfortunately ReMake lived a short life because the Mac version was killed in March, 2017 and Autodesk decided to discontinue ReMake as a whole at the end of 2017. Since december, the product has been moved under the ReCap Pro subscription. This costs $40 a month or $350 a year. This also gives you the original ReCap Pro software suite, which focuses on processing an registration of laser scan data for construction and engineering purposes (it’s also the dedicated software for the innovative Leica BLK360 laser scanner). 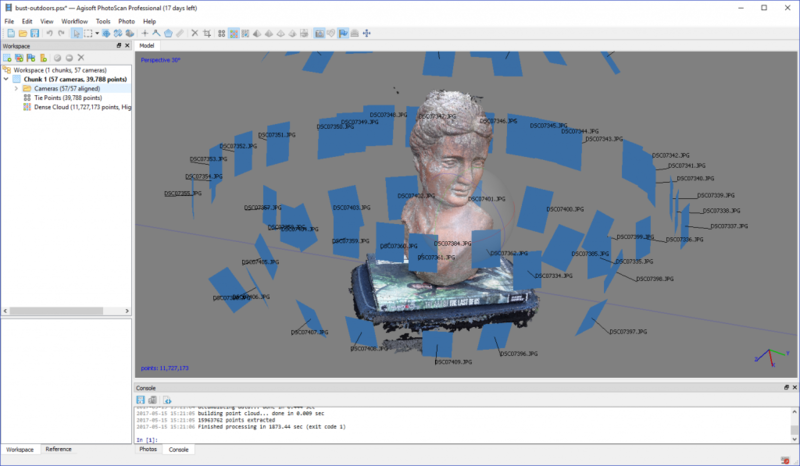 To fit within that concept, ReCap Photo got new support for areal photogrammetry features. But since this is not my current interest, I will not focus on UAV/drone-based photogrammetry in this post. I am making plans to focus on this I will revisit this post at that time. It’s noteworthy that Autodesk also (silently) discontinued the ReCap 360 (Reviewed here) web-based interface which used to also be free up to 50 photos. 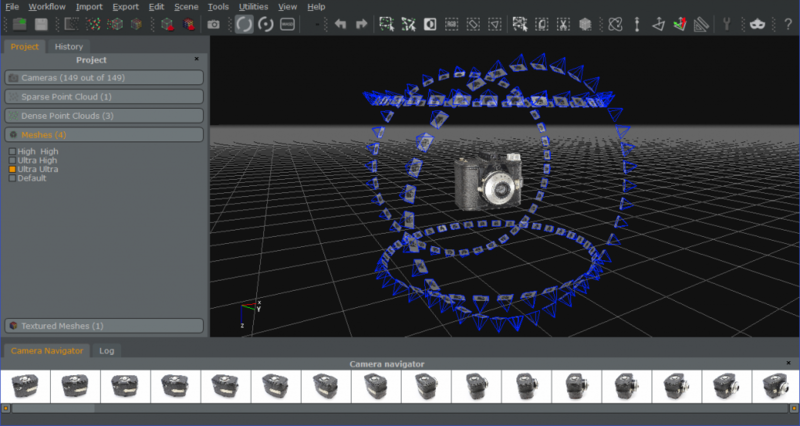 I know many people that loved this simple approach to 3D capture, including myself because it also worked on Android. How does ReCap Photo differ from the discontinued ReMake? So I initially though it would then be a slightly more expensive version of ReMake — but I was wrong. While the layout and workflow are largely unchanged, Autodesk has completely removed local processing support. This means that on top of the subscription fee, every scan will consume cloud credits! 1 to 300 photos will use 12 cloud credits. 301 to 700 photos will use 30 cloud credits. 701 to 1,000 photos will use 55 cloud credits. As far as I can see a 100-pack of Cloud Credits is $100 or €115 (ex. VAT) so processing a 3D capture of objects (that typically use less than 300 photos) will cost $12 / €13.80. 300+ photos is limited to areal captures. In ReMake, Cloud Processing in High Quality costed 5 Cloud Credits. This was even available in the Free version. So the cloud got quite a price bump in the last few months. Autodesk removed all settings except auto-crop (formerly Smart Crop) so you can’t control the quality like in ReMake which offered Standard and High Quality settings plus a few options within each when processing locally. It appears that all quality settings are now simply pre-set to the highest settings ReMake had to offer. Still included are all the great mesh editing tools, including basic sculpting, hole filing, boundary smoothing, bridging and the very easy-to-use slice tool. 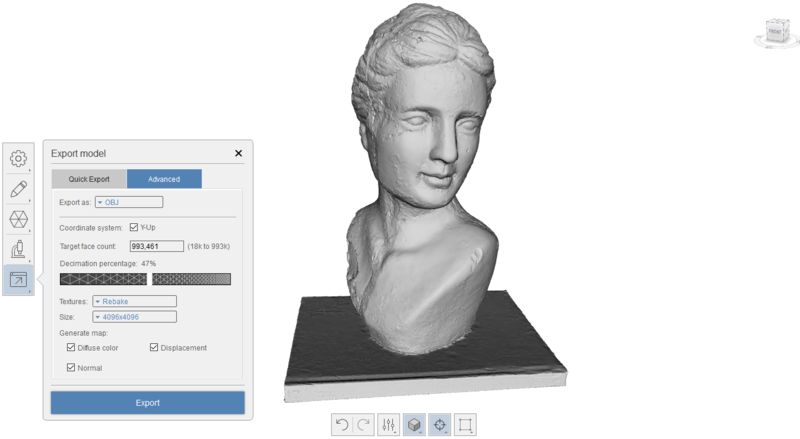 See my ReMake Review for detailed examples of each tool and a lot more example scans! On top of the editing tools, ReCap Photo also still offers the unique export feature that can decimate the high-resolution mesh while generating Normal and Displacement maps at the same time. Great for game engines and VR/AR applications. It even includes Quick Export presets for popular game engines like Unity and Unreal. Let me start with saying that Autdesk’s photogrammetry algorithms are still top-class. And you really have to switch to MatCap mode (press 3 on your keyboard) to judge the differences in geometry quality. If you do this, you’ll see that the ReCap Photo results are a bit softer and less detailed. This is probably a result of the cloud processing preset not allowing the user to push the quality to Detailed/Sharp like local processing in ReMake used to offer. It’s clear that Autodesk has been struggling about where to place their photogrammetry software. Ultimately, they have decided the best place was under the umbrella of their main 3D scan program ReCap, targeting the construction and surveying industries. I neither get and like that approach, because I believe that ReMake was a great program that offered a lot of possibilities for creative purposes in 3D animation and game design, markets that Autodesk actively supports through industry-standard software such as Maya and 3DS Max. I really hope they will also make their photogrammetry tool available as a feature for those users. Sure, you can still get the biggest part of the ReMake experience by subscribing to ReCap Pro, which includes ReCap Photo. The subscription is only slightly more expensive than ReMake was. But the biggest issue is that Autodesk has decided to remove the great and even reasonably fast local processing feature — and the even greater quality that offered. And they made cloud processing more than twice as expensive. 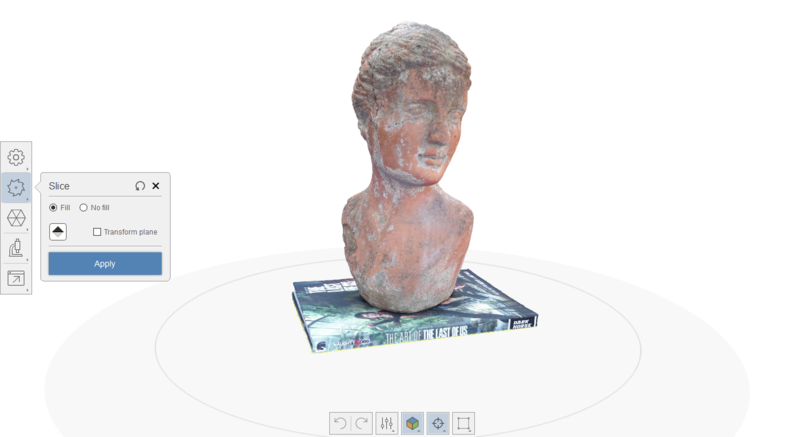 So now matter how good the software still is, ReCap Photo simply isn’t an obvious choice for people looking for photogrammetry software to capture objects or small environments. Especially when there’s good software around like 3DF Zephyr (which offers both a 50-photo Free and an affordable 500-photo Lite version — without subscriptions), Agisoft PhotoScan (which offers an affordable Standard version and a very feature-rich Pro version — without subscription) and RealityCapture (which is subscription-based but so incredibly fast that it might save more than it costs). Want advice about which Photogrammetry software is best for your specific purpose? If you want to be the first to know when new features are introduced to photogrammetry solutions, be sure to follow me on your favorite social network or subscribe to my monthly newsletter below. it is a pity about what happened to this good Autodesk product. I hope that they do not change license for very popular Fusion 360 as well. I am using Altizure now… I think it is best choice if you are on a Mac because it is web based like old Recap and results are even better in my first tests. Prices are quite good (around 5-12$ for a model) and you can process model preview for free. I am wondering why you do not review it? I actually never heard of it! But now I have and I’ve put it on my list to check out. Thanks for the tip. We were doing the trial for ReCap Pro, and we noticed that all the photogrametry had been moved to the cloud. It’s much slower, offers no user control, and is significantly more expensive compared to what we’re used to. We will not be going with ReCap Pro or ReCap Photo for these reasons. AutoDesk should seriously reconsider bringing back local processing. Thanks for the review, Nick. Luckily there are many good alternatives. Zyphyr is not the only free option. There’s Visual SFM, which is free and open source. I made a tutorial on it. Thanks for the tip! I will test Visual SFM soon! Actually, the origin of ReCap can be traced to a little hands-on photogrammetry program I used to use a lot back in the early 2000s called RealViz Image Modeler. Autodesk acquired RealViz 10 years ago, and for a while sold Image Modeler and Match Mover. A couple years later they came out with the free “Project Photofly,” which was Image Modeler with automatic cloud-based photogrammetry added. Then it became 123D Catch for a few years -and it still retained the ability to open RealViz Image Modeler files. They discontinued 123D Catch 2 years ago to make way for ReMake, and now ReCap. Very interesting. Thanks Geoff. I’ll add it to the post for other to read. 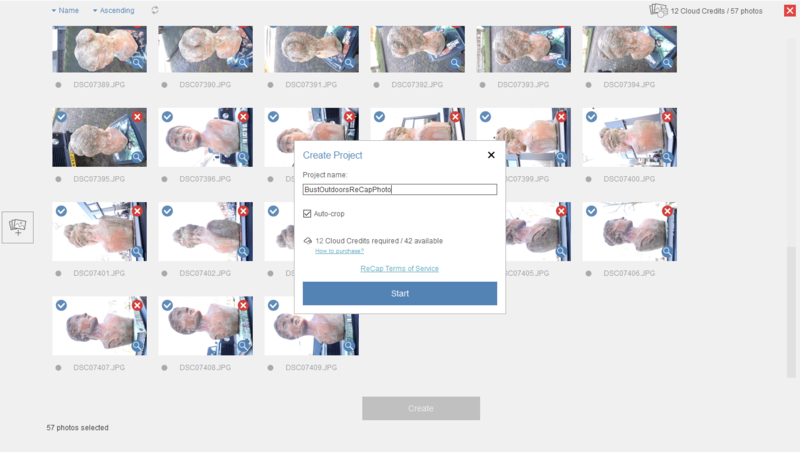 Although I do like companies that are constantly innovating, I have troubles with Autodesk’s software strategies for their Photogrammetry tools. Professionals require software to be supported for many years to be able to implement them into their workflows. This is what happens when MBA losers get their hooks into creative companies and don’t listen to the creatives. They LOSE BUSINESS. BUH BYE AUTODESK! You almost had me, but BUH BYE! -There would be a QR Code to scan on a printed banner.